Using targets when practicing helps develop a visual sense of the court. By this, I mean that I find myself visualizing what target I wish to hit as I set up for the shot and while I am making the shot. In an interview some time back, John McEnroe indicated that he liked to visualize where each ball would land as he made contact with the ball. We all know how accurate his placement was and is! When I am visualizing a target, I find that my body and mind work together to achieve the goal. It amazes me how accurate my shots become after only a short period of target training. What amazes me even more is how often I can actually hit a target when I am not even looking at it! For me, visualizing shots greatly helps my shot accuracy. Finally, I find that target training improves the consistency of my shots. This makes complete sense when one realizes that accuracy is the key ingredient in achieving shot consistency. To perform your best you need to be totally prepared, excited about your challenge and acting without too much conscious control. Players who think too much through every point of a match lose the spontaneity and focus needed to excel. It's like the early stages of learning how to ride a bike, when someone was standing by your side and telling you to peddle faster, keep the handlebars even, and maintain balance. Before long you fell flat on your face from the overload! Overlearning during practice allows you to go into automatic pilot during the game. Overleaning means limiting the number of goals, reducing errors, and doing something so many times that you could perform to perfection in your sleep. 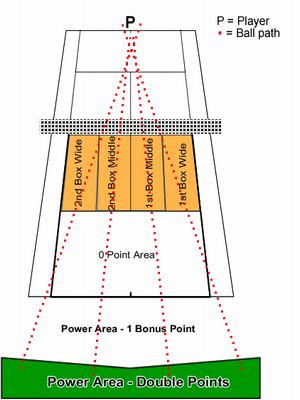 For example, you might hit 100 easy overhead smashes on one bounce from the service line. Presented with this same situation in a match, you just do it without questioning, thinking, or choking. One Goal at a Time In overlearning, make sure to avoid squeezing too many skills into one session. It's far more important that you focus intently on one component of your game. This may involve overlearning mental skills. For example, I have worked with players on-court where I will suddenly ask them to freeze and tell me what they are thinking. By repeating this throughout the practice, we both get feedback about the quality of that player's focus. Before long, it becomes apparent how the player needs to adjust focus for optimal performance. After overlearning this mental skill of concentration, focus becomes automatic in the game and the player's performance improves. Reduction of Errors: Another aspect to overlearning is the need to eliminate all errors. By going far beyond what is needed to learn the skill, the player becomes extremely proficient. Perhaps we'll spend 30 minutes longer than is necessary practicing a skill that is already well established until there are absolutely no mistakes. This helps develop the motor program (for a physical skill) or the thought pattern (for a mental skill). Once again, when the situation arises in actual competition, the mind and body act freely and with precision. High Volume Learning and confidence go hand in hand. When a skill is extremely well learned, there is simply no doubt, and confidence soars. This never occurs by accident. It requires a smart coach or smart player who realizes that perfect practice and many repetitions is the key to appearing natural. No great athlete is really born. Skills that appear so effortless on center court are born of sweat, strain and time. By repeating a particular point sequence or mental challenge over and over, almost to the point of boredom or exhaustion, the player acquires the experience needed to trust his or her actions and let go of conscious control. Keep on Going: Learning never really ends, but if your practices are well planned, you will continually improve your skill. Once you think you've mastered a mental or physical skill, don't end there. Look for new areas to improve upon. Strive for perfection in your game. The process of going into auto-pilot is just a way for you to isolate particular needs and then to practice them until you have it. Many players constantly shift from one skill to another without really developing any area completely! While I am not suggesting that you put on the blinders and only work on one thing throughout a practice, I do encourage you to go into auto-pilot more often. Spend part of your practice on a variety of skills, but save time for making at least one skill more automatic each day.